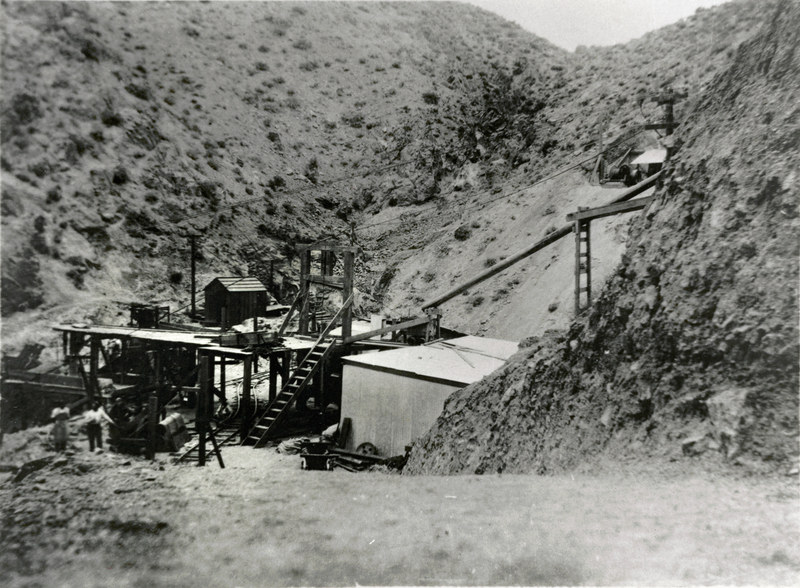 SCVHistory.com AP1316 | Unknown | Mine in Soledad Canyon? At first blush, one might assume this photo from the A.B. Perkins collection shows the Sterling Borax Works in Tick Canyon off of Davenport Road around 1910. Note the dinky train tracks underneath the structure at lower left. Tracks are pretty common at mines for ore and waste cars. You can't just assume that those are dinky train tracks. Even Tick Canyon had other tracks besides those for the dinky train. I think this is probably from up Soledad Canyon at one of those mines. There is just not enough evidence to say Tick Canyon, in my opinion. After looking carefully at this photo and having spent many days sampling water and dump material at Tick Canyon, I don't think this photo is of the Sterling Borax Works. The geology appears to be wrong. The dumps from the shaft in the upper right of the photo don't look like sedimentary rocks (silts, clays, limestone) that they would encounter at the Sterling underground workings. Even allowing for the darkness of the photo and the fresh, unweathered rock, it still doesn't look right. The surrounding hills and outcrops don't appear to fit the geology I know of the area around the mine. I also can't fit the topography into the Tick Canyon-Sterling Mine area. The mine workings don't seem to fit the layout of the shafts and adits at the mine. So in my opinion this is not a photo of the Sterling Borax Mine. AP1316: 9060 dpi jpeg from copy print.